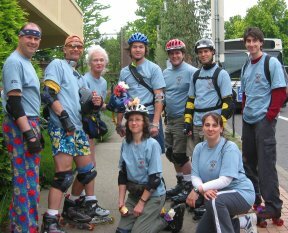 Inline Skating In Portland Oregon and Beyond! ATL Where Roller Skating Rules! Spring is upon us, however briefly, but while it is we might as well skate! Check out the photos From previous years. The inner and outer race (made from steel). The balls (generally made from steel). The cage (made from different materials including nylon, plastic and steel, to keep the balls spaced properly around the bearing). The shields (which act to keep the dirt and dust (or in the case of the speed skaters, road kill out of the bearings). When all levels of ABEC are made with the same standard of quality, a ball-bearing in an ABEC 5 will spin faster because it has less room to move laterally, thus all it's energy is propelled forward. The unfortunate part is that not all bearings are made to a high standard. It is all a matter of quality. The better bearings are made perfectly round and smooth. The races and bearings in a good skate are honed and polished two or three times. In cheap bearings, the ball-bearings are very rough with many imperfections. There are other factors but it becomes more complicated. Just remember that if you purchase a skate with a good quality bearing you will roll along just fine. To illustrate this, one of the fastest consumer level bearings on the market is the Boss Swiss Bearing which is not even rated. Industry experts say it is probably an ABEC one or three. Racers will often use ABEC 1 bearings in their skates (these would sell for $160 plus). My mate's bearings spin longer - are they better? The simple answer is "Not necessarily". Let me explain. The difference between spinning the wheel and seeing how long it takes to stop and actually using the bearings during skating is the loading on the bearings. When you are skating, there is a lot of force from all of your weight on those bearings. When you hold the skate up, the only load is the weight of 1 wheel. Raise the bank until the pencil rolls down the bank, and note the angle. Which do you think will need the steeper slope? This is the one that would spin longer unloaded. Which do you think would roll better with 80kg on it? That is the one that would make a better bearing. Basically, the resistance caused by lubricant is unaffected by the load on the bearing. The resistance caused by irregularities in the bearing surface will increase with the load. As such, with no load; lubricant drag is the dominant force whereas with a large load surface quality is dominant. This is why the spin test is of no use at all in determining how well the bearings will perform when you are skating. by NLH Productions, All rights reserved.